Follow these steps to tune up your B2B marketing program and drive new business. Determine percentage of your company’s revenue that needs to come from new business. Determine the percentage of your company’s new business revenue needs to come from marketing generated leads. 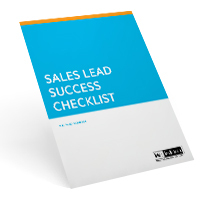 Determine how many new inquiries are needed in order to identify enough qualified B2B sales leads that can close during the period. Loved the article – our challenge was scaling this. Creating defined personas, researching leads, A/B testing approaches, landing pages etc., was fine on a small scale but now that we are in growth mode, we are finding it increasingly hard to justify the time required to do this. Colleagues suggested trying a data enrichment or lead generation companies (RightHello, Bant. io, SalesWhale) – anyone had experience with this?